The Galloping Gazelles are learning about the water cycle through simple experiments related to evaporation and condensation. 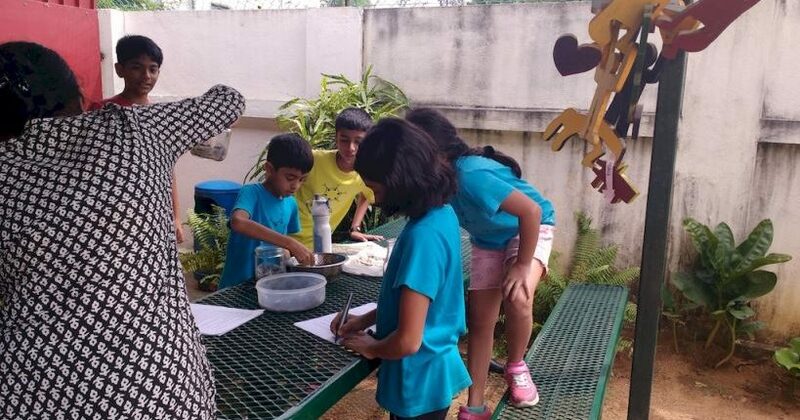 As an extension activity, they made terrariums in small groups with the help of their homeroom teachers. A terrarium is a collection of small plants growing in a transparent sealed container (preferably, glass). It is a closed environment, and can actually be used to demonstrate water cycle. A few children brought glass jars from their homes. The jars were cleaned and kept ready for set up. Learners watched sample videos and pictures to understand the process. Before the making of terrariums, a “Do-it-Yourself” Checklist was also given to the each of the learners, for them to go through and understand the process. Three material stations consisting of gravel, potting soil, and charcoal were set up for learners to start the construction. With the help of three teachers, children constructed layers with the materials in the order specified in the checklist – gravel, charcoal, potting soil. This was followed by selection of plants that can sustain in terrariums. There was a lot of learning when children found out that the plants that they picked did not fit into their jars. They eventually realised that they should keep in mind the size of their jars during this selection process. Eventually, it became a “treasure hunt”. After planting their newly uprooted plants, they decorated their jars with white pebbles and figurines to complete the look. Within a few hours, the children were excited to see drops of water around their glass jars showing the process of condensation. They will continue to observe their terrariums over the next few days and check for extra moisture or over-dryness. Their terrariums have been kept in an area of their classroom which gets indirect sunlight. Classroom terrariums are a great learning tool, can be created in any setting, and can be big or small. They are usually used for learning about ecosystem, habitats, and water cycle. Designing a terrarium is also a form of artistic expression that adds another layer to their learning process.